Middle Grade Ninja: Introducing The NINJA BOOK CLUB!!! Introducing The NINJA BOOK CLUB!!! It's time for yet another new feature, Esteemed Reader! For years, we've been looking at a book a week and I plan to keep right on doing it. I love reviewing so many diverse middle grade novels and having their authors here to face the 7 Questions whenever possible. To discuss Harry Potter properly would require multiple posts and even then is there anything to say about Harry Potter that hasn't already been said? Probably not, but there are lots of things that haven't been said by me:) And to be clear, I'm not going to be talking about the movies, I'm not going to be posting fan fiction, nor am I going to write love letters to J.K. Rowling. I'm the Middle Grade Ninja and in this dojo we will be discussing the book, one chapter at a time. Starting next week and for the next 37 weeks we will be discussing one chapter of Harry Potter and the Goblet of Fire per week. Why? Because book 4 is my favorite and the one I most admire, though part 2 and part 6 are close runner-ups. What I like about this idea is that it will allow us to put an objectively successful middle grade novel under the microscope. By painstakingly going through each chapter we'll perhaps be able to pull its guts out and see what makes it work. Granted, me analyzing J.K. Rowling is like one of those 2001 monkeys jumping and hollering around a monolith from another civilization, but I'll do my best. And hopefully I won't be doing it alone. If this sounds like fun to you, Esteemed Reader, why not join me? Who doesn't have time to read one chapter in a week? You can meet me here each Wednesday and comment with your thoughts on the week's chapter. And should you forget to read it, I'm betting if you love middle grade fiction, Harry Potter is familiar enough you'll still be able to chime in. The ending of Harry Potter and the Sorcerer's Apprentice was lame. I know it and you know it, even if you never acknowledged it to yourself. That book succeeded in spite of its weak sauce finale because the craftsmanship and the characters were so wonderful everyone wanted to read more. Imagine this: another famous orphan hero finally faces the Joker for the first time and just before they battle, he passes out and awakes at Wayne Manor, trusty manservant Alfred Pennyworth at his side. Bruce Wayne: Where am I? What happened to the Joker? Alfred: He escaped, I'm afraid. But you still saved the day, kinda, sorta! Bruce Wayne: Really? That's funny. I don't remember fighting him or anything. Seems like all the training I've done and the story leading up to that confrontation would sort of demand a battle between us. Alfred: Nope. You just fainted and when you came to everything was magically better. Magically. Bruce Wayne: Really? He didn't try to kill me while I was unconscious? Seems like that would make more sense. Alfred: Don't worry about it, Master Bruce. There's a hereto untold magic spell protecting you so that the Joker couldn't harm you. It's the power of love, dude. Bruce Wayne: So not only did we not fight, I was never really in any danger? Alfred: Pretty much. And now everything's magically better. Magically. Bruce Wayne: And you think readers will find that satisfying? Alfred: We should be able to sell them six sequels! Also, whole chapters of Harry Potter and the Prisoner of Azkaban were dry, exposition-riddled snore fests. That's right, I said it! Oh yeah, the gloves are coming off, Esteemed Reader. We'll show J.K. Rowling what happens to people who try to spread joy, wonder, and a love of reading to children! 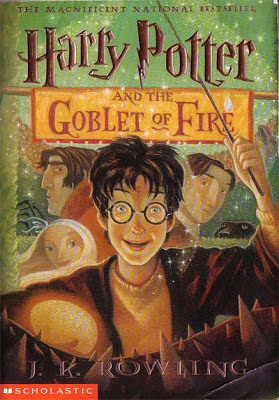 If all this sounds like fun to you, Esteemed Reader, meet me back here next Wednesday for the first ever post in the Ninja Book Club, when we'll be discussing the first chapter and only the first chapter from Harry Potter and the Goblet of Fire.